This evening I tested the Trangia inside the cast iron housing which features a few posts above. It was tested under very similar conditions to the open structure I tried last night, i.e. indoors, same burner height, similar amount of water in boiler. Last night with the open structure it took 50 minutes from cold before the safety valve blew off. This evening with the cast iron housing an hour and a quarter in and still nowhere near. There was also an acrid smell - not overpowering but unpleasant. I'm not sure if this came from poorly combusted alcohol or from the plasticky paint inside the housing, but I gave up the ghost and turned off the heat. So, even though I thought that the housing was plenty open enough, clearly it wasn't, so I'll use the open structure if and when I fire the boiler with the Trangia in the future. I guess this could be an option for indoor use. Hi Gary, still following along. Sorry I have been a bit quiet the last few days. A few comments to bring me up to date with my thoughts and observations. The point about heat conduction to the plinth from the trangia burner might be important. Meths has to warm to 93 deg before it boils to make the vapour that issues in blue tongues from the holes around the rim. 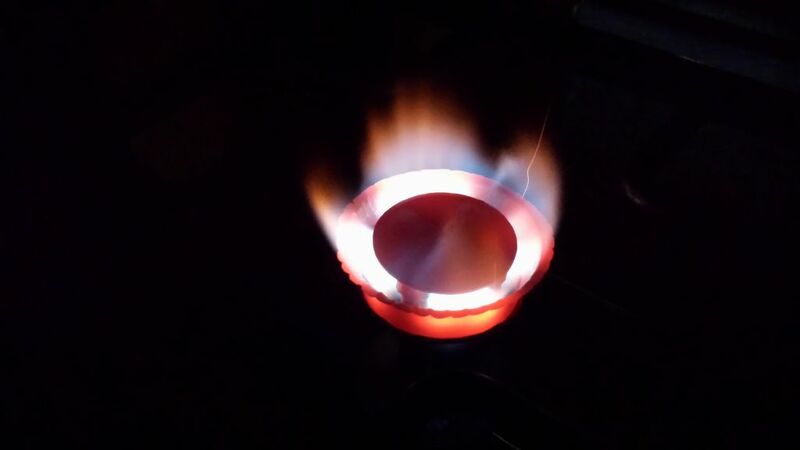 Heat loss through the base might limit the amount of meths that could be evaporated. A disk of cork or ply, or replacing the Al plinth with a wood block would be worth a try. I see two issues in the air flow, getting enough air to mix with the fuel and then getting the combustion gases to flow through the boiler flue tubes. It looks like you have plenty of air flow to the burner, but your boiler flue tubes present a very small flow area compared with the intended use of this burner where the combustion gases flow up the outside of a pot around the full circumference. This might be why you are needing tome spassisted draft to get enough flow through the tubes. 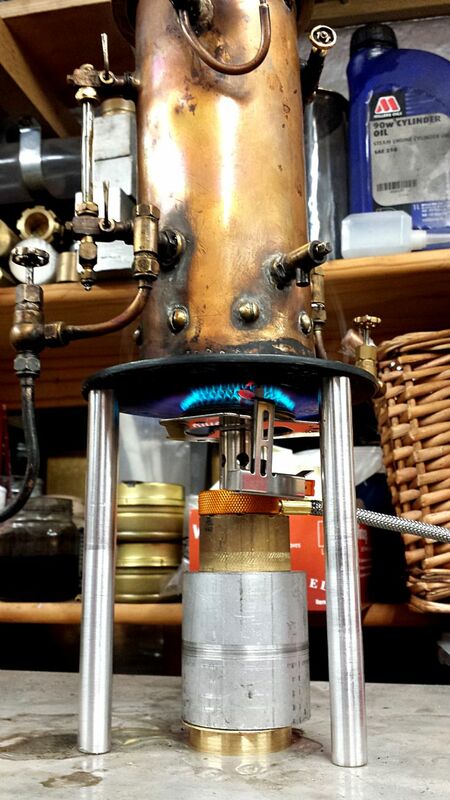 I expect you might get more heatfrom the gas burner, definitely worth a try, but may still have the same issues getting enough hot gas flow through the tubes. Again some draft assist might be required. I don’t know if those safety valves arrive preset, but I suspect you have to check them before relying on them. I tend to be suspicious of very small pressure gauge calibration. A couple of things you can do to get an idea of accuracy. First, I assume you did manage to lift the valve using pliers or similar to make sure it was not stuck when it arrived. 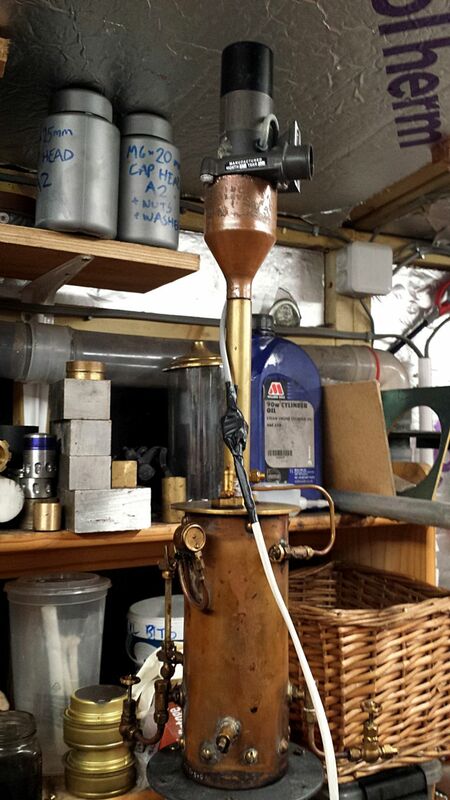 First, make a replacement filler plug for the boiler that will accept a thermocouple, called a thermowell. The hole for the thermocouple is blind so does not leak pressure. I will try and attach a picture to show you the idea. Then standard steam tables tell you the pressure corresponding to the temperature. 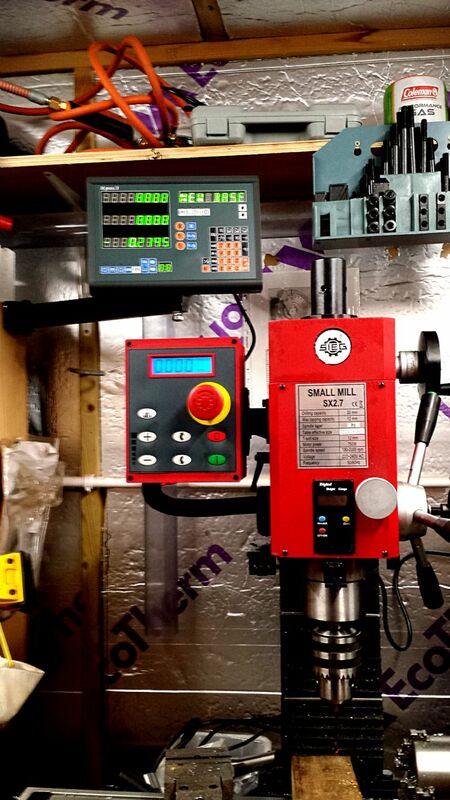 Depending on the safety valve design, you may be able to use a thin rod to lift the valve and use a digital scale to measure the force at which the valve just starts to lift. 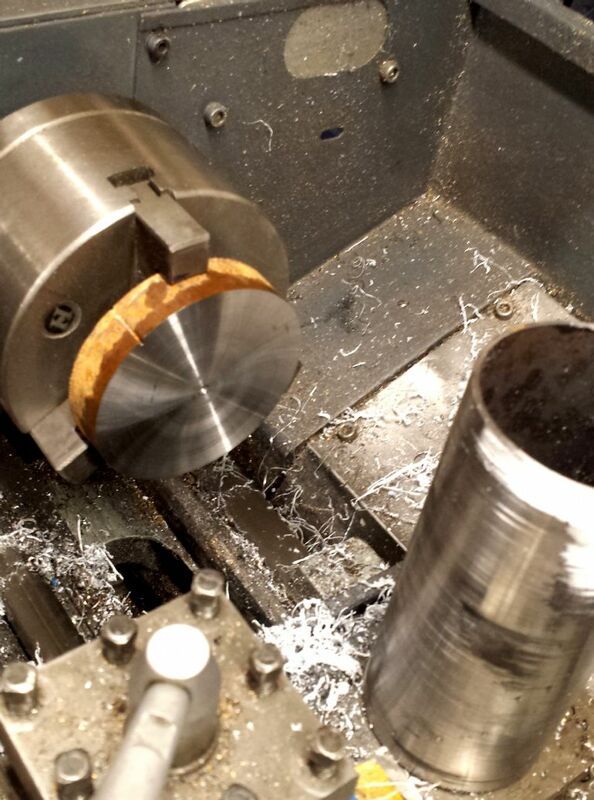 Then measure the diameter of the hole which forms the steam passage, it might correspond to a standard drill size. The set pressure can then be calculated from the force and area. Mind you there are a few inaccuracies in this method, not easy to tell just when the valve starts to lift, so a bit of inaccuracy there, and measuring small holes is subject to some error. 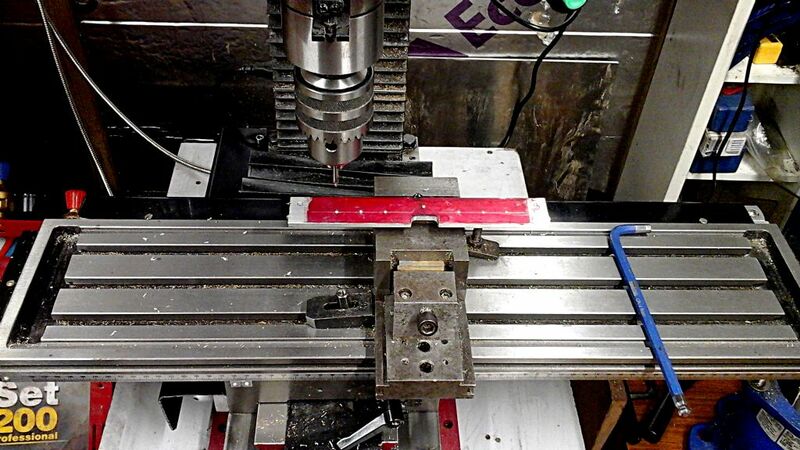 It is probably reamed so testing with the shank of some drills will give a reasonable idea if it is a standard size. Again not sufficiently accurate for a boiler inspector, but should be able to tell the difference between 45 psi and 70 psi. Best is comparing it with an accurate gauge by a club boiler inspector, first cold on air, then checked hot in a steaming test. All the best for the continuing experimentation. I'm not too worried about the safety valve question at present. I always test it with pliers before firing the boiler (a habit from my childhood days with a Mamod). My guess is that the main culprit for inaccuracy is the gauge but as you say that's unverifiable without another testing method. 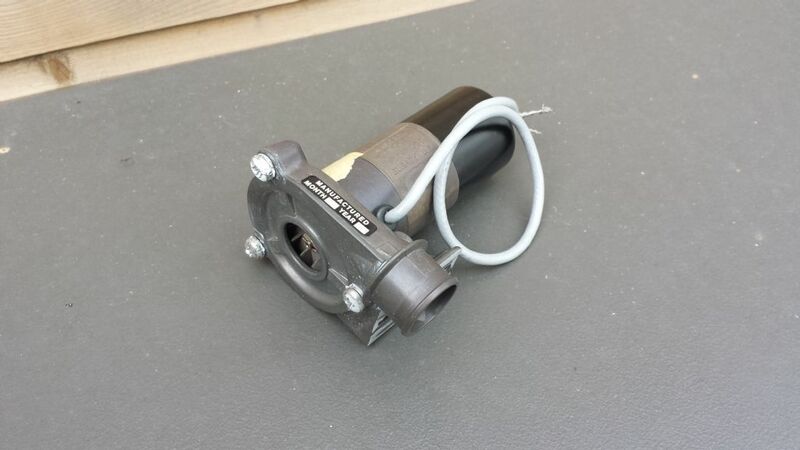 The boiler doesn't have a filler plug - it has a hand pump and check valve, so I wouldn't be able to install a thermocouple in the way you suggest. For now, I'm content to know that the safety valve works, which it does. I knew you wouldn't recommend anything less! Not sealing the reducer is fine by me. One less job to do. It was pure luck that it wedged neatly between the screws. This evening I decided to actually try running the boiler rather than just heat it up and gaze at it in stupified awe while it did its thing. Using the gas burner, I took it up to 50 psi on the gauge. I had the gas turned up a bit higher than last night and it took me 10 minutes to reach 50. 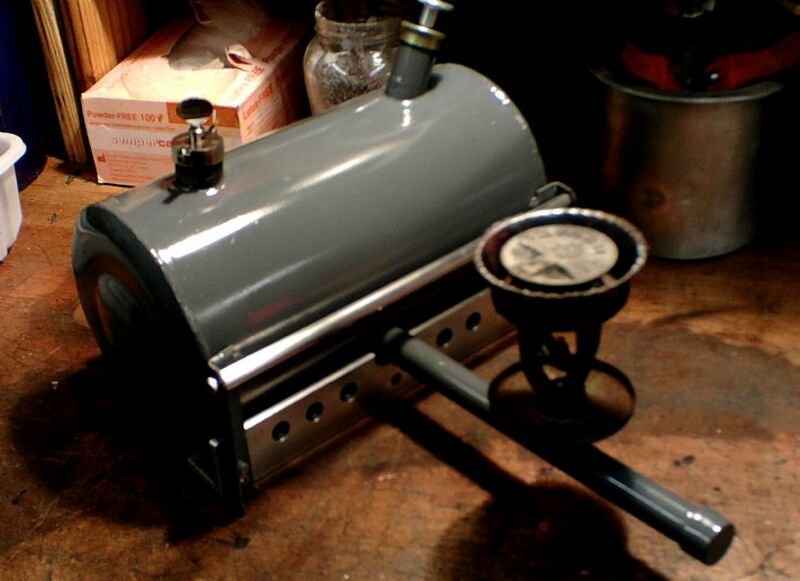 I then opened the steam takeoff valve a bit, resulting in a steady jet of steam which made a narrow strip of paper which I held in front of it flap. The pressure stayed at 50 until I opened the takeoff a bit more, at which point it dropped a little, but it was easy to get it back up again just by restricting the steam out a bit and/or turning up the gas. I went on like this for 20 minutes, with the pressure between 40 and 50 most of the time. At one point it dropped to 30 psi, but that was mainly due to inattention on my part I think. I pumped in more cold water several times and the system recovered quite quickly from that. After 20 minutes, I decided to have a fiddle with the steam blower. I was amazed at the dramatic effect it had even with the gas turned up full. The gauge went up fast, and looking up into the bottom of the boiler I could see the flame being sucked up the tubes. I think the blower on this boiler might be useful even with gas. I'm tempted to be pleased with this, but the one thing I do not yet know is whether or not that jet of steam will drive an engine. Unfortunately, though, it is attached to the mill's axes by nothing at all as yet and so remains decorative for the moment. That said, I did make a start on making the mounting brackets for the glass scales. 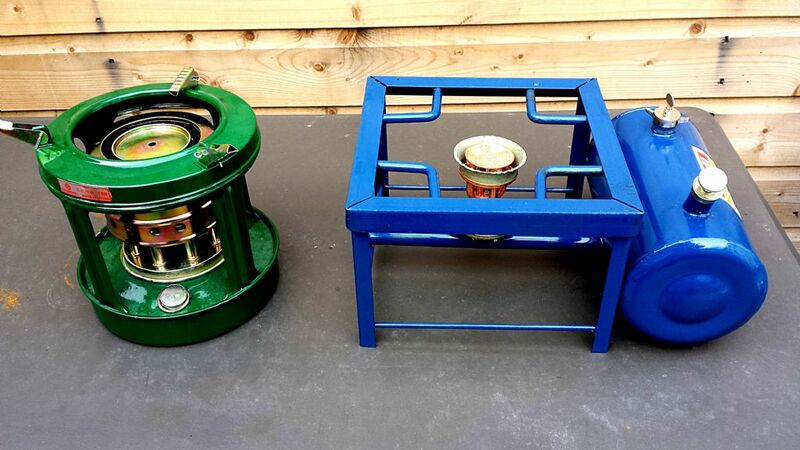 In the green corner we have an eight-wick kerosene stove from China. It has a catalytic converter/secondary combustion chamber/whatever you want to call it. 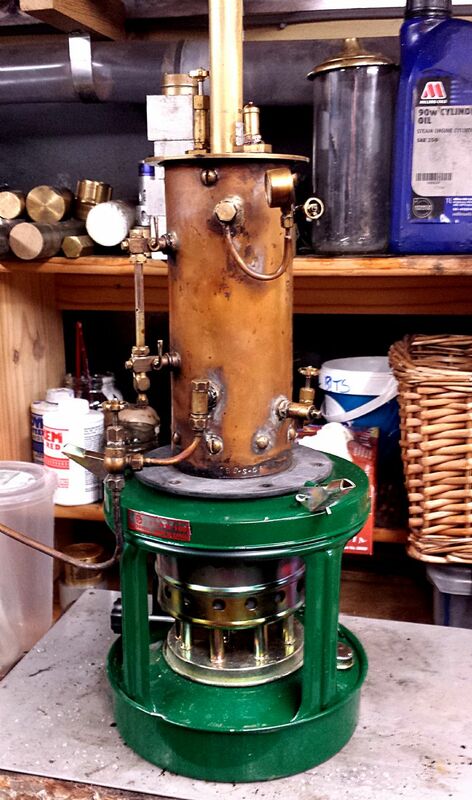 Although it is not a pressurised unit it vapourises the kerosene and generates a fiendish amount of heat. Unfortunately I took no photos. I did shoot some video but that comes later. It cost less than a tenner, including shipping. Assuming these two bad boys raise steam, they will be hacked and modified as final alternative heat sources for the boiler, which will be fun and allow for some creativity. However, I will wait until I try them on the boiler before chopping them up so that if they don't work they can always be used as stoves or repurposed for something else in the future. Either way, no great loss at the price. Trials with each of these under the boiler soon. In contrast, the green 8-wicker didn't even have the needle off the peg in 15 minutes. It's a nice stove of a kind I haven't seen before, and it burns with a very hot flame but a flame of the wrong size and shape. Some fiddling with heights would help, but not enough I reckon. 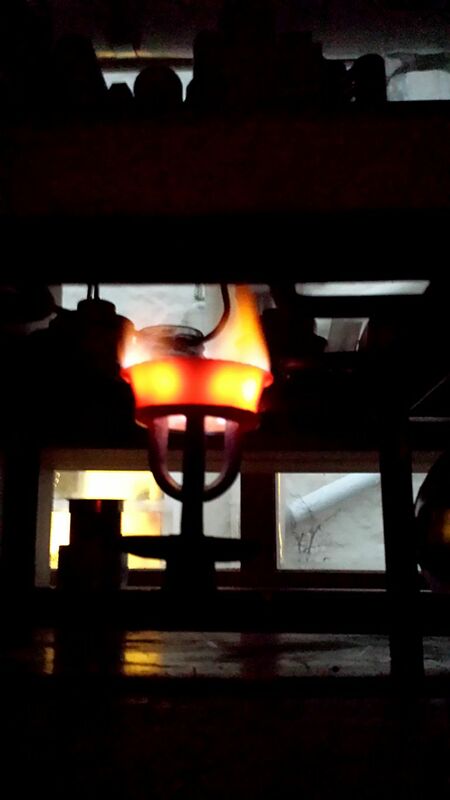 The steam blower made a considerable difference, pulling that soft flame into a neat cone which pushed the pressure up fairly quickly, but this revealed another problem: when the safety valve blew off the flame went out. Not sure why, but it did. That's a problem with this stove because the burner assembly is such that either it or the boiler would have to be removed to relight it. 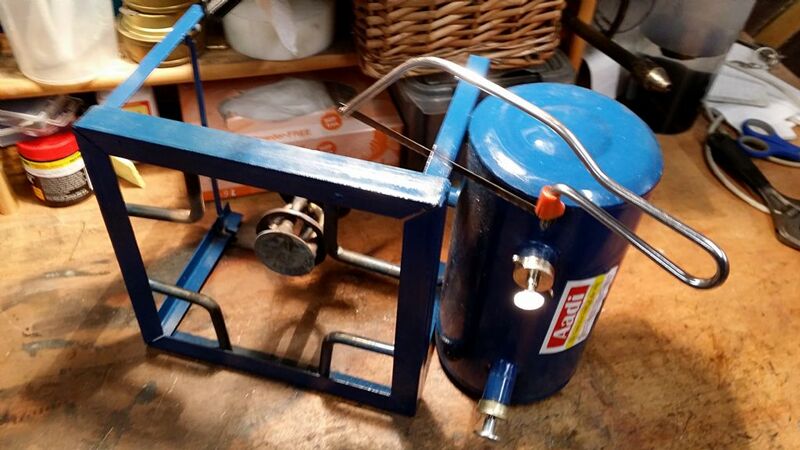 The pressurising one is much easier to relight because the burner is accessible. It will be very pleasant to use the 8-wick stove to cook a pot of couscous on the patio in France in the Summertime as the barbecue sizzles. 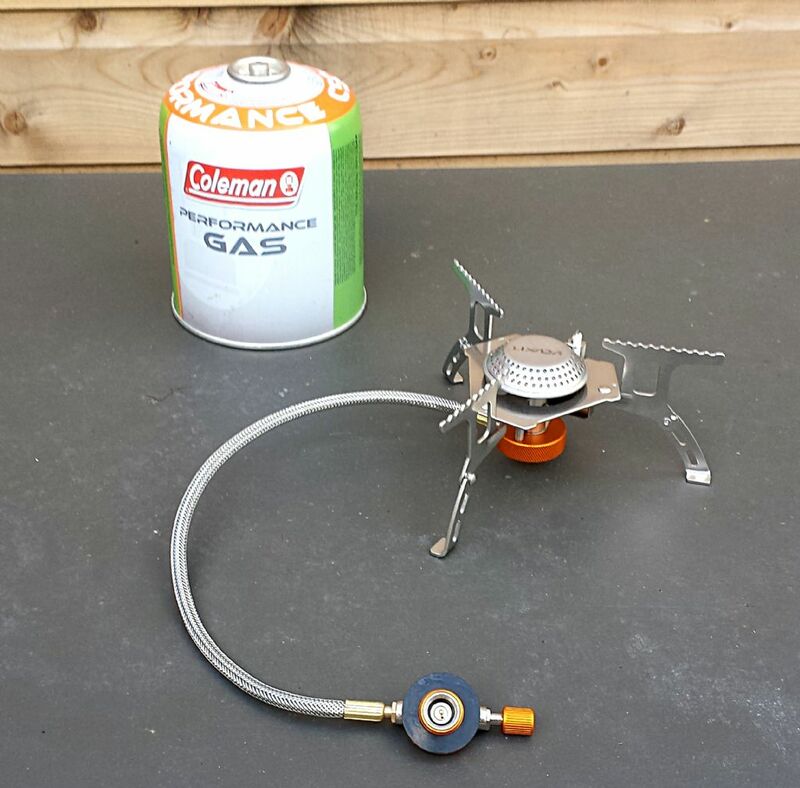 So... thus far the promising contenders are the gas burner and the blue kerosene stove. The square pot stand on the stove will be cut off. I intend to use these two heat sources interchangeably. The idea is to have them both set at the same height so that they can be set in position without doing anything to the boiler. 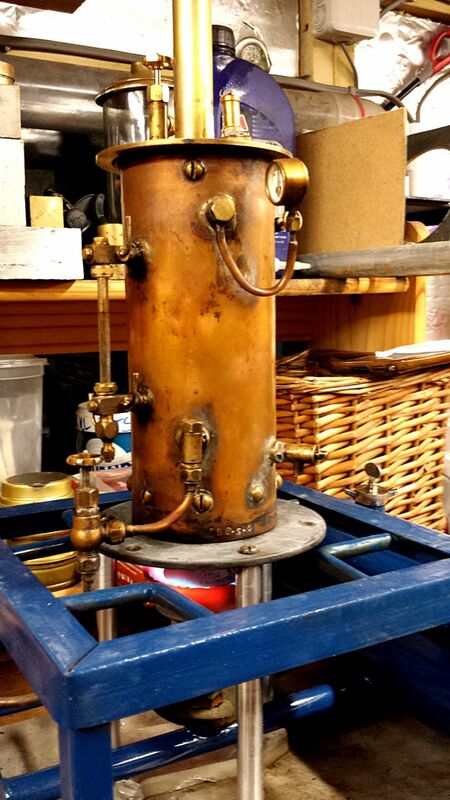 I also aim to make a cool-looking boiler stand and burner supports. However, the proof of the pudding will be in testing the setup out on an engine, so I'd better get on and start building one. Whether or not the boiler will run on coal assisted by the electric blower remains to be seen, and I intend to have a second go at making a firebox for it. 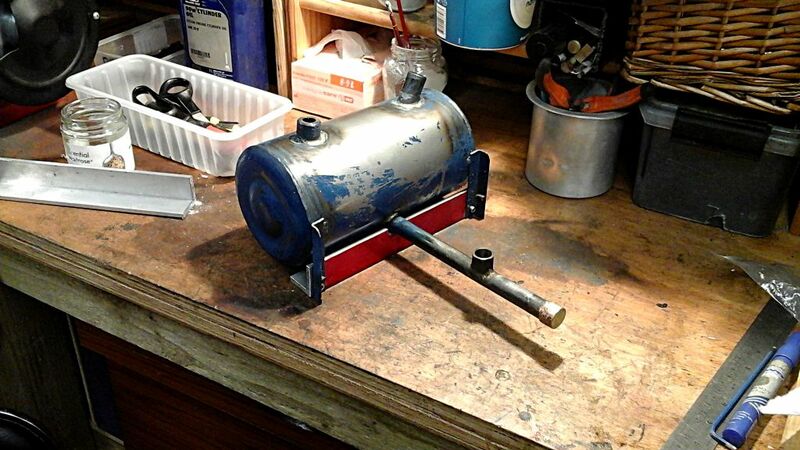 I may do this in parallel with building my first engine, which I shall start once I have the DRO fitted to the mill. I'm just about to start a new thread on the build of the engine, basic and simple as it will be given it's my first effort. When that is done, assuming all goes well with tests, I'll return to the boiler and this thread. With the cooking pot frame removed, it all starts to look a bit less cumbresome. So... I got the rest of the paint off the tank, primed it and sprayed it with dark grey Rust-o-leum 'Painter's Touch' spray paint (which I have always found to be very good when I have used it). The support bracket was drilled with various holes both functional and decorative, and I also added a rail which contributes little structurally but makes the whole thing look more finished, given that I couldn't remove the legs that it is fixed to due to the risk of disrupting the existing silver soldering. This will eventually be fixed to a baseplate along with the other elements in the plant, though it will be interchangeable with other burners. I'm quite pleased with the look, though the photo leaves a bit to be desired - it was taken with my new video camera which I only got today and haven't found my way around yet.